Remember my friend Katy and her yellow + gray + pink nursery? 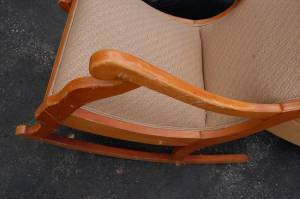 I have some great pictures to share of her rocking chair revamp. Much like my last nursery project, Katy and I found an inexpensive rocking chair second-hand via Craigslist. This time time we only paid $30! Yes, it's in a parking lot. The consignment shop selling it had it packed in a storage unit, so they unpacked the unit for me to show me the chair. Once we had the chair, our next step was to take it and our chosen fabric to my magical upholsterer Hakan Saka of Simply Reupholstery. Hakan not only upholstered the chair this time, but he also painted it. And the results were awesome, as usual. I love how Hakan laid the pattern on the chair and the paint job is perfect. It is a completely different chair and incredibly chic! And bonus is that it's really comfortable for Katy. I've told you guys about Hakan before, but I will keep recommending him to anyone in the area. He's based out of Sterling and works quick and his pricing is very reasonable. 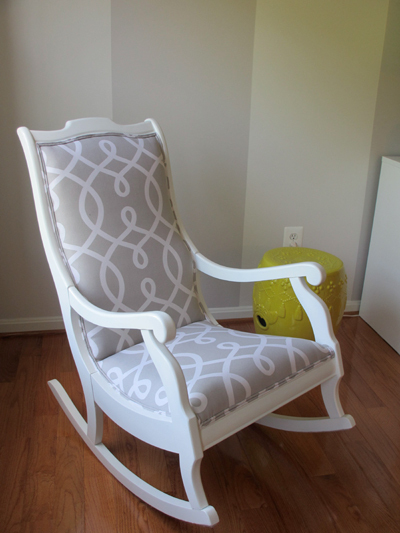 If you are interested in revamping a piece of your own, contact him at simplyreupholstery@hotmail.com. How gorgeous!! Love the chair makeover. Looks fabulous! 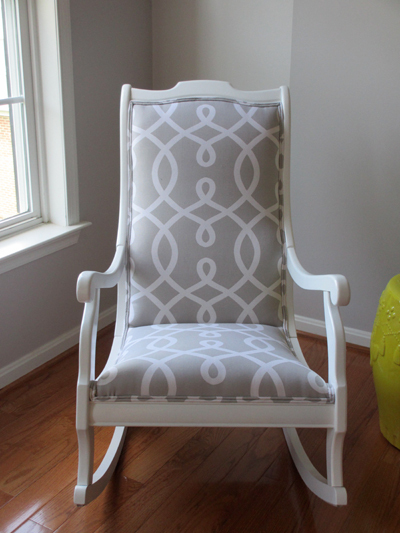 that chair has gorgeous lines--and Ilove how your fabric choice really plays them up! What a great transformation! Thank you for the tip- Sterling is close to us! What a great job and the colors match perfectly. 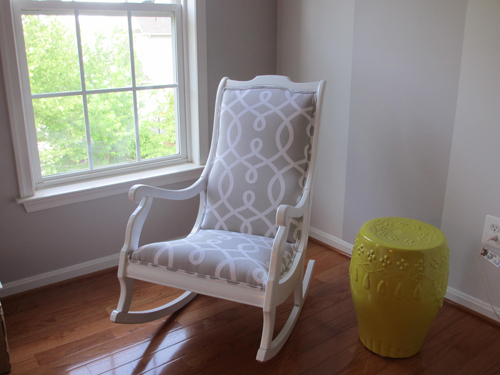 It does not even look like the same rocking chair, the colors and fabric choice make all the difference in the world. Just curious, what was the overall cost to transform the chair ? Loooove the new rocker. And wishing that I had my own Hakan to work similar magic in the Westchester area! You are lucky (and, of course, talented :) Amazing job! This is such a fun project. I was so surprised to hear that you used Hakan! 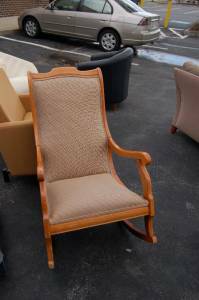 I live a couple miles from his new location, and he just reupholstered a vintage wing chair for me. We were blown away by his precision and his willingness to make sure we were 100% happy. I know this was posted awhile back, but it is amazing to randomly find someone else who uses Hakan! Best wishes to you! I love the fabric and would like to find it to use on my own rocking chair transformation. What is the fabric called and where can i find it?